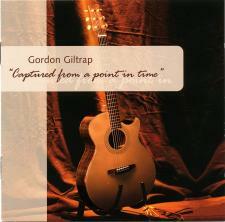 "Captured From A Point In Time" is the latest addition to the extensive catalogue of recordings by Gordon. It "captures" live tracks from concerts recorded in various locations around the UK, including a bonus track of the stunning "The Dodo's Dream" played on electric guitar using a loop station to multitrack the sounds, which audiences have been waiting to get hold of. Includes an 8 page booklet of photos and notes by Gordon. This album is the reissue of Fingers Of Fire (2002), a compilation of live tracks recorded at different concerts and originally released in aid of arthritis research. The links have been edited out and the applause is low in the mix, but the music retains the warmth and humanity of a trademark Giltrap performance. The 'set list' comprises many highlights from Gordon's live repertoire and draws on a range of techniques and moods that will entertain guitar enthusiasts and casual listeners alike. Gordon's maxim is to keep his customers satisfied, and there's a bewildering assortment of guitars, styles and techniques on offer here, from the harping on 'Nursery Chimes' through the thunder and lightning of 'Lucifer's Cage' to the furious double-strumming of the inevitable 'Heartsong'. Topping it all off is the bonus track, a recent studio version of 'The Dodo's Dream' from The Peacock Party (1981). Performed on a Telecaster copy with two effects boxes, it's a swirling, whirling piece of looping electric trickery, always popular at concerts and making its much-anticipated debut on record. The CD itself is neatly presented with insightful liner notes written by Gordon, tunings for each track and some sympathetically mellow photography. It's not as good as being there, but it's a delicious appetiser.